Cinclus mexicanus is the only aquatic songbird found in North America, but it goes by several names—the American dipper, the water dipper, or the water ouzel. It is a grapefruit-sized bird that inhabits mountainous riparian areas. 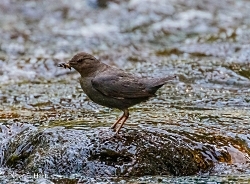 It has brownish gray plumage, stubby wings and tail, and ornithologists sometimes refer to it as “stocky,” “chunky,” and even “chubby-looking.” However, the dipper has no shortage of energy, and can be seen careening at low altitudes over mountain streambeds and crashing beak-first into fast-flowing water, always in the upstream direction. 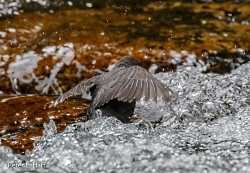 The dipper hunts for food by diving into swift, shallow rivers and hunting underwater. It muscles its way upstream, picking off aquatic insect larva, crayfish, and even tadpoles and minnows. Several adaptations assist the dipper in this seemingly reckless feeding strategy. Nictitating eye membranes enable the dipper to see underwater, and specialized flaps of skin on the dipper’s beak seal its nostrils. Dippers produce more feather oil than less adventuresome songbirds, which keeps them warm and dry, even in near-freezing water. Perhaps most noticeably, the dipper has long legs and specialized, unwebbed toes to grip the stream bottom, hold steady in the current, and push along upstream. 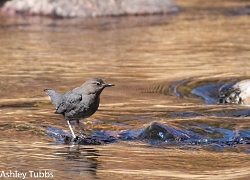 The American dipper was once more commonly referred to as the “water ouzel,” after its European cousin, Cinclus aquaticus, but ornithologists changed the preferred common name to “American dipper” to better distinguish it based on a unique aspect of the bird’s behavior: American dippers dip. The dipper bobs rapidly up and down by bending its legs—like deep knee bends. Dippers dip while paused on rocks between dives, they dip while feeding in the water, and they even dip while they’re still fledging in their nests. So, why do dippers dip? There are a number of theories. First, dipping may help the birds visually isolate reference points beneath moving water, so that they can more accurately dive for prey. Dipping might also help to conceal dippers from predators against a busily moving backdrop. But the best theory about dipping is that it’s a form of communication between dippers within the noisy environment of mountain streams. Unlike other songbirds of the United States, the dipper does not migrate to warmer climes in autumn—it stays put all year, usually moving only short distances to avoid iced-over streams or to take advantage of shifting forage availability. Like the American dipper, I too am a year-round denizen of mountain streams. I enjoy fly-fishing all year, even when it’s very cold, and aside from trout, the dipper is the creature I most enjoy seeing while I’m fishing. I figure that if a 6-ounce bird with feathers and bare legs can brave summer’s roasting heat and winter’s bitter chill, then so can I. But more importantly, the American dipper is known as a “biotic indicator species,” meaning this bird is known to thrive in streams with clean water and robust forage, while it abandons streams which are impaired or polluted. So, when I see American dippers dipping and diving in my home waters, I know I’m fishing in a river system that is healthy and strong. For Wild About Utah this is Chadd VanZanten.